This map demonstrates territory of Russia. Displayed capital of Russia huge city Moscow download for free. Displayed city Tula download for free. Displayed city Kaluga for Garmin. You can find here city Zelenograd download for free. On this map city Podol'sk for Garmin. city Mytishchi presented. Displayed city Lyubertsy free download. city Balashikha for Garmin. You can find here city Kolomna free download. 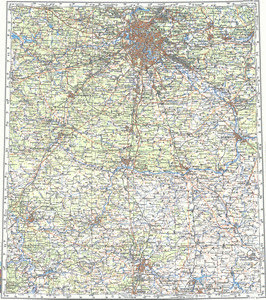 On this map city Elektrostal' free download. Displayed city Khimki presented. Displayed city Korolev presented. city Odintsovo for Garmin. You can find here city Novomoskovsk free download. city Serpukhov for Garmin. You can find here city Orekhovo-Zuyevo presented. You can find here city Noginsk for Garmin.